Achieving the perfect ponytail on my fine, curly hair can be a bit tricky. I used to suffer with frizz while trying to make the ponytail voluminous. Sometimes I’d have little to no definition in my curls and my ponytail looked pretty boring. I have found a way to keep the volume and definition without dealing with frizz. The best way to keep the definition in your curls is by working with second or third day curls or, in my case, styling my hair on day one and not touching my hair until it was 100% dry. After my hair dried, I scrunched to release the cast and then had a bit more volume that I could work with. 1. I took a small amount of SheaMoisture Yucca & Plantain Anti Breakage Styling Milk because it helps with moisture and slicking my hair back. You can use any leave-in conditioner you favor most to smooth down the hair that will be pulled back. 2. Have lots of flyaways? Use some edge control. I like SheaMoisture Jamaican Black Castor Oil Edge Treatment to keep my edges healthy and strong. If you don’t have edge control lying around, try a light hairspray. 3. I gather all of my hair at the crown of my head to give my ponytail some height. 4. I take a hair tie and wrap it twice. I don’t like for the ponytail to be too tight because my edges would be prone to breaking (no curly girl wants that!) Depending on the size of your hair tie, you might have to wrap it a third time. Just remember that if it feels too tight--it probably is. 5. Use a soft bristle brush if you want a sleeker look to smooth the hair. Personally, I like my ponytail with some texture. Since I don’t smooth my hair down with a brush for a sleek look, I always end up with bumps in my hair. All I do to get rid of the bumps is tuck them underneath hair that is flat to hide them away! For a bit more volume, I gently pull or tug on my curls at the top of my ponytail. My curls are always left defined, frizz free and filled with volume which was usually difficult for me to achieve before on my fine curly hair. 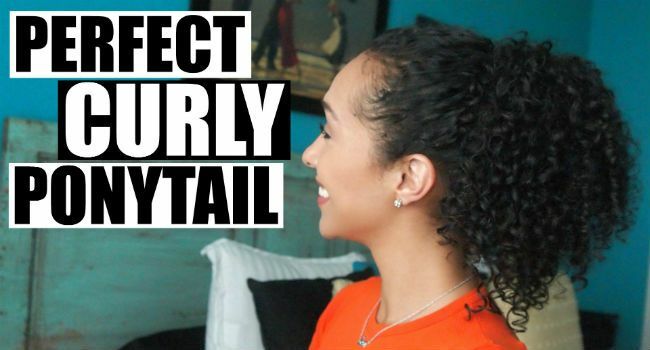 How do you keep your curly ponytail frizz free? I’d love to know!